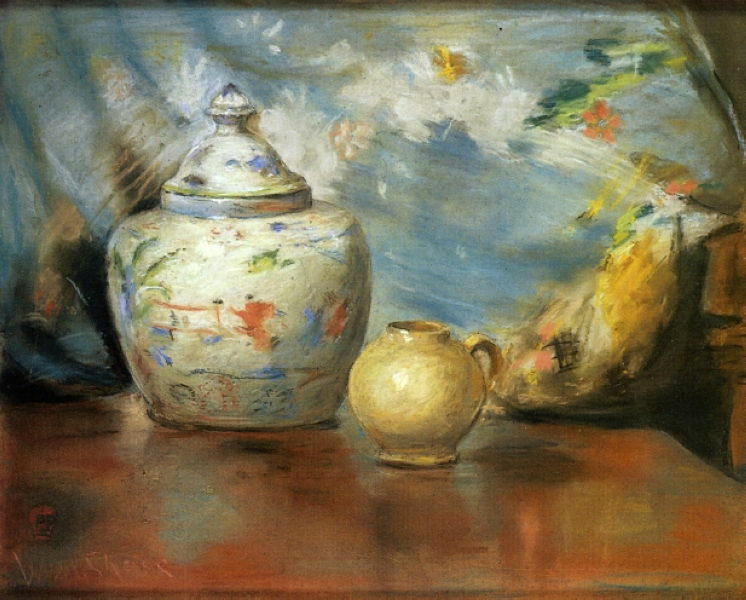 Still life painting has been popular among impressionists. Some, like Cézanne, made it central to their art, the means by which they tested approaches before taking them out into landscapes, for example. 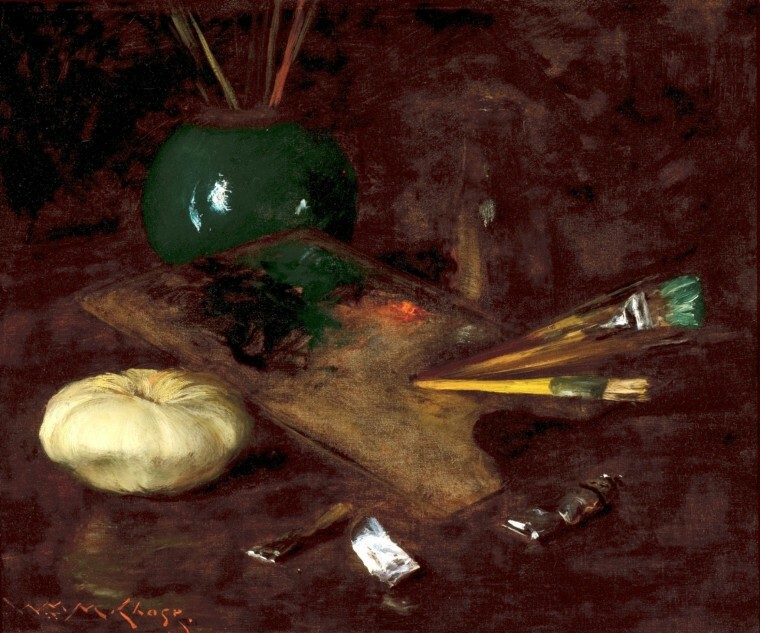 William Merritt Chase (1849–1916) painted many still lifes, for rather different reasons. Early in his career, when his style was realist and before he went to Europe, they were a safe bet for bringing in some cash. 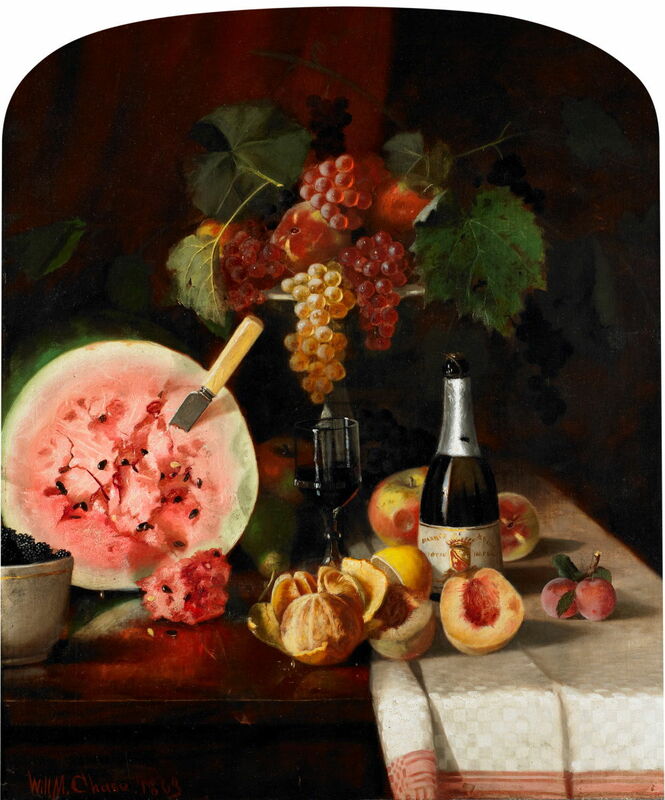 A painting like his Still Life With Watermelon (1869), painted when he was still nineteen and before he enrolled at the National Academy of Design in New York, would have graced any wall in a well-appointed dining or drawing room of the day. William Merritt Chase (1849–1916), Still Life with Hummingbird (1870), oil on canvas, dimensions not known, Indianapolis Museum of Art, Indianapolis, IN. Wikimedia Commons. 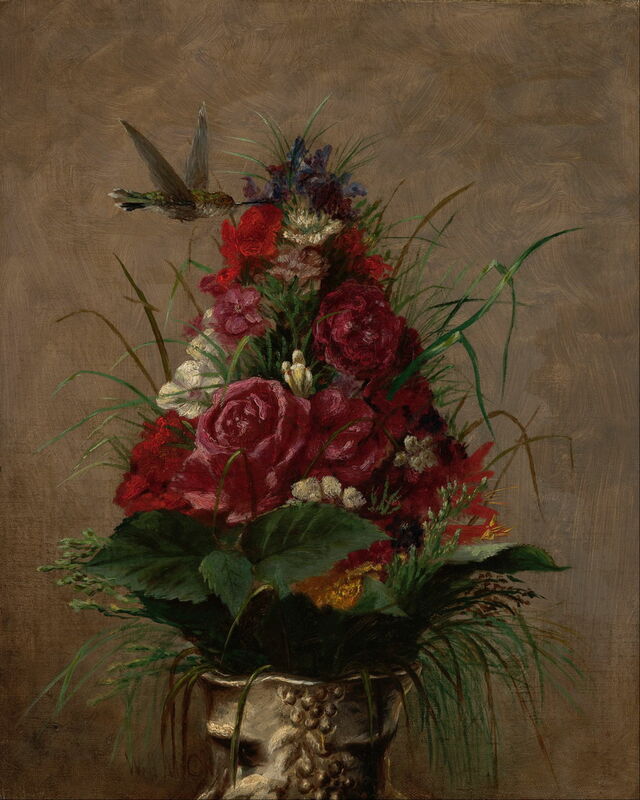 Still Life with Hummingbird (1870) introduced some genteel novelty too, and would have had wide appeal. This may well have been painted after he had had to leave New York and rejoin his family in St Louis, Missouri. 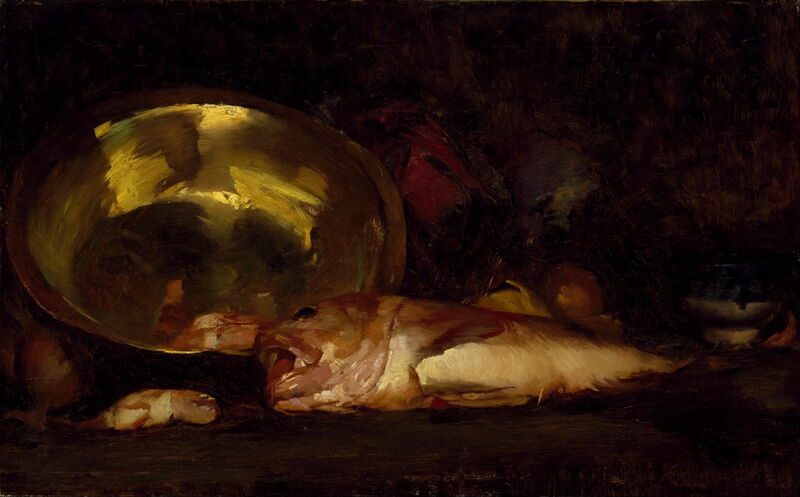 William Merritt Chase (1849–1916), Still Life with Vegetable (date not known), further details not known. Wikimedia Commons. 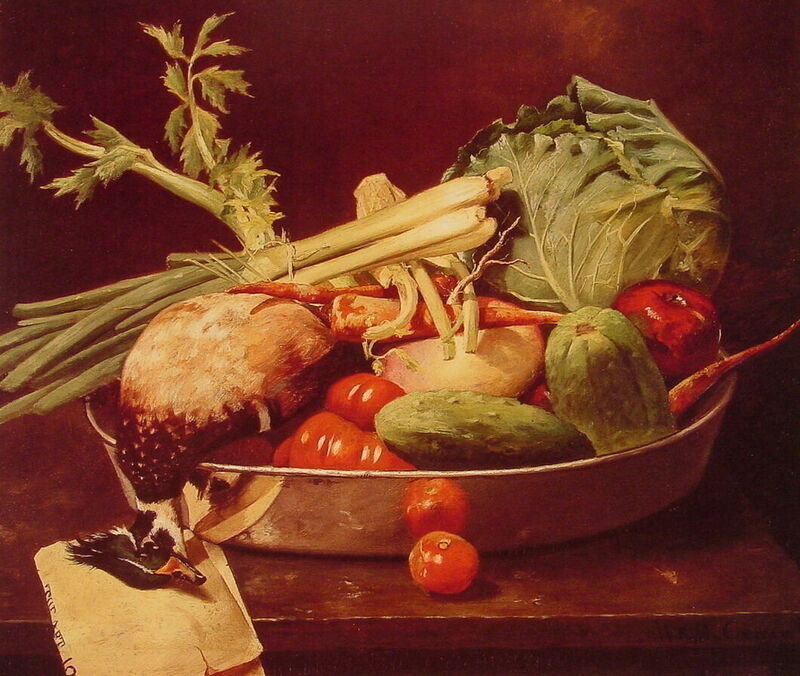 Although I do not have a date for it, I suspect that his Still Life with Vegetable was painted at around this time too. William Merritt Chase (1849–1916), Still Life with Fruit (1871), oil on canvas, 77.5 x 63.5 cm, Parrish Art Museum, Water Mill, NY. WikiArt. 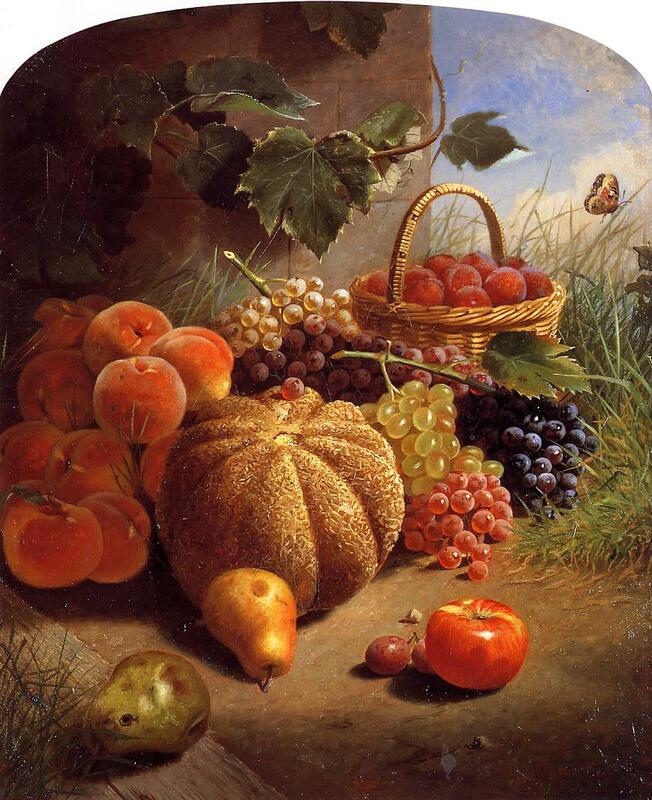 Still Life with Fruit (1871) was also painted before he left for Europe, and was probably one of his paintings which impressed the group of St Louis businessmen sufficient for them to sponsor those studies overseas. In return for the $2100 which they provided Chase, he gave them a painting each. William Merritt Chase (1849–1916), My Palette (1870-80), oil on canvas, dimensions not known, Reading Public Museum, Reading, PA. Wikimedia Commons. Not a conventional still life, but still a fairly traditional variant of the genre, My Palette (1870-80) shows an extremely limited palette, which seems more plausible of his time as a student in Munich. William Merritt Chase (1849–1916), The Yield of the Waters (A Fishmarket in Venice) (1878), oil on canvas, 124.5 x 165.1 cm, Detroit Institute of Arts, Detroit, MI. Wikimedia Commons. After completing his studies in Munich, he spent several months in Venice, where he painted one of his best-known still lifes, The Yield of the Waters, also known as A Fishmarket in Venice, (1878). 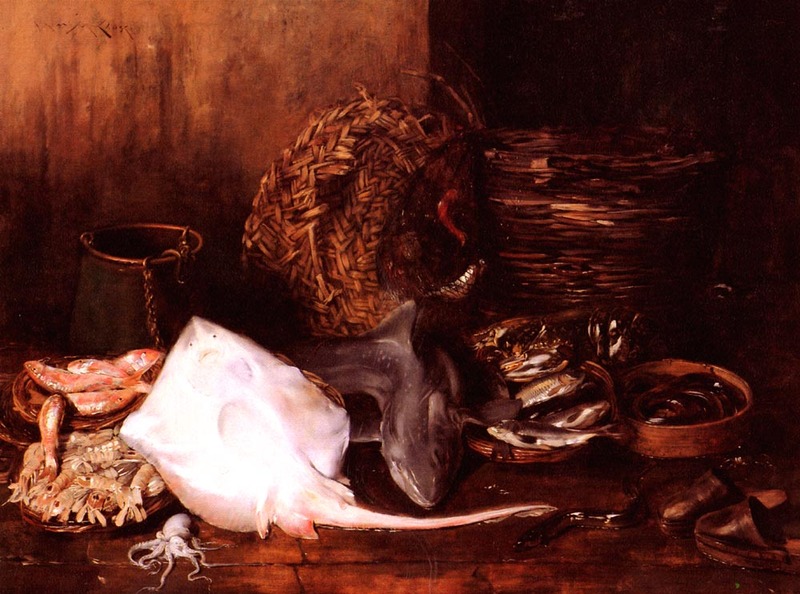 This was probably his most complex and detailed still life, showing a wide variety of the fish and seafood available in the Mediterranean. 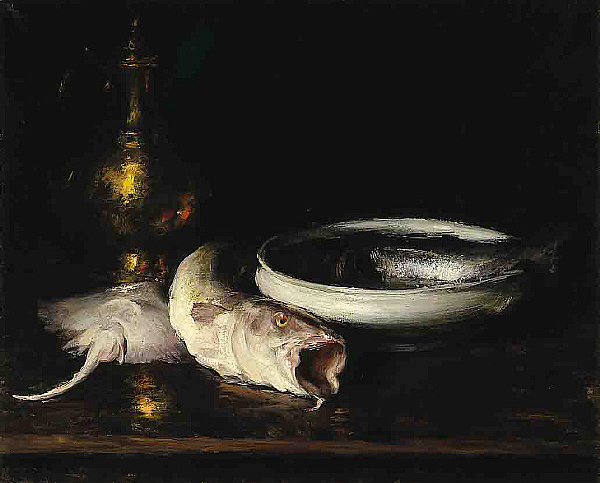 It also established his own specialist sub-genre of still life: fish, characteristically set against a very dark background. Soon after returning to the US, he became engaged in teaching, and most of his subsequent still life paintings were probably made when he was teaching, as demonstrations to his students. William Merritt Chase (1849–1916), Still Life with Flowers (1883), pastel on paper, 38.1 x 48.3 cm, location not known. Wikimedia Commons. 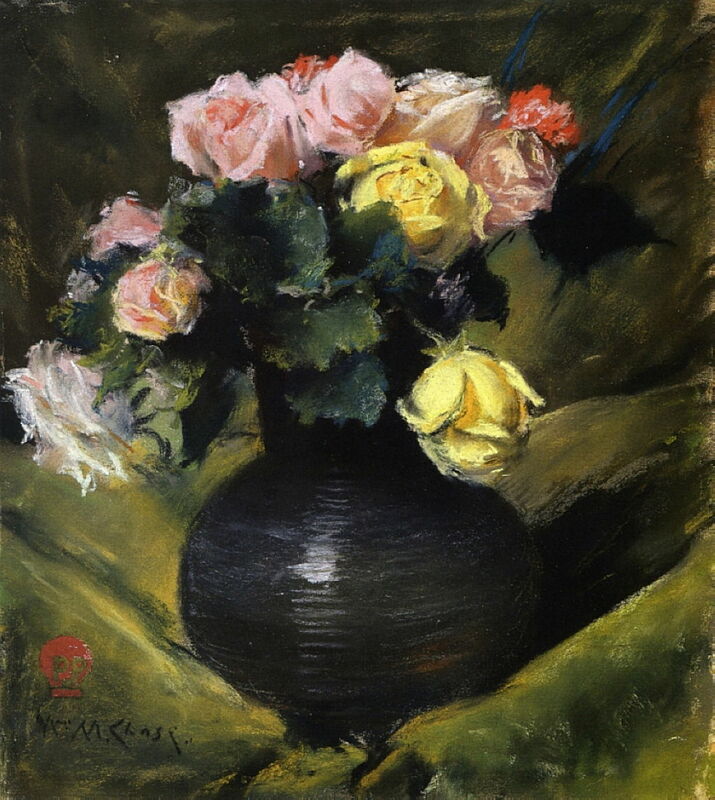 Still Life with Flowers (1883) and Flowers (Roses) (1884-1888) (below) are both painted in pastels. The former shows his enthusiasm for Japonisme at the time. William Merritt Chase (1849–1916), Flowers (Roses) (1884-1888), pastel, 33.0 x 28.8 cm, location not known. Wikimedia Commons. 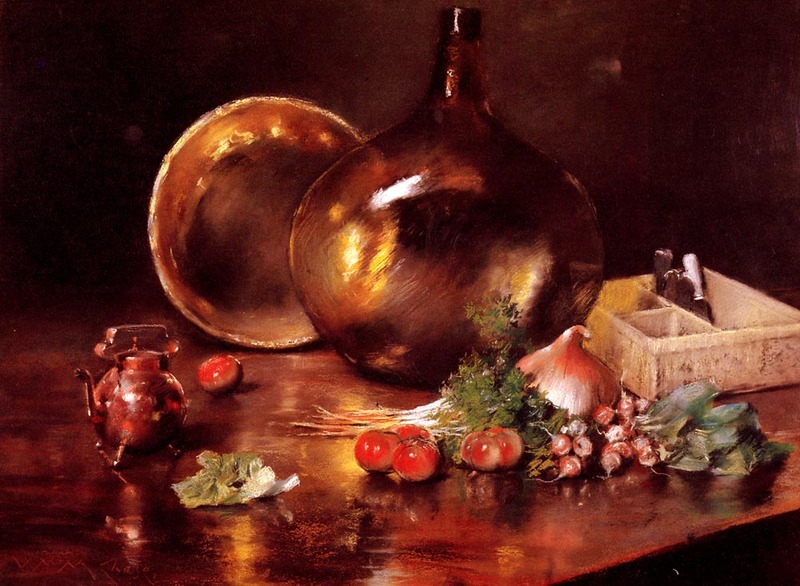 Still Life Brass and Glass (1888) is a virtuoso example of painting reflections on polished metal, glass and wooden surfaces. William Merritt Chase (1849–1916), Fish and Still Life (c 1904-1909), oil on canvas, 45.7 × 66 cm, Dallas Museum of Art, Dallas, TX. Wikimedia Commons. 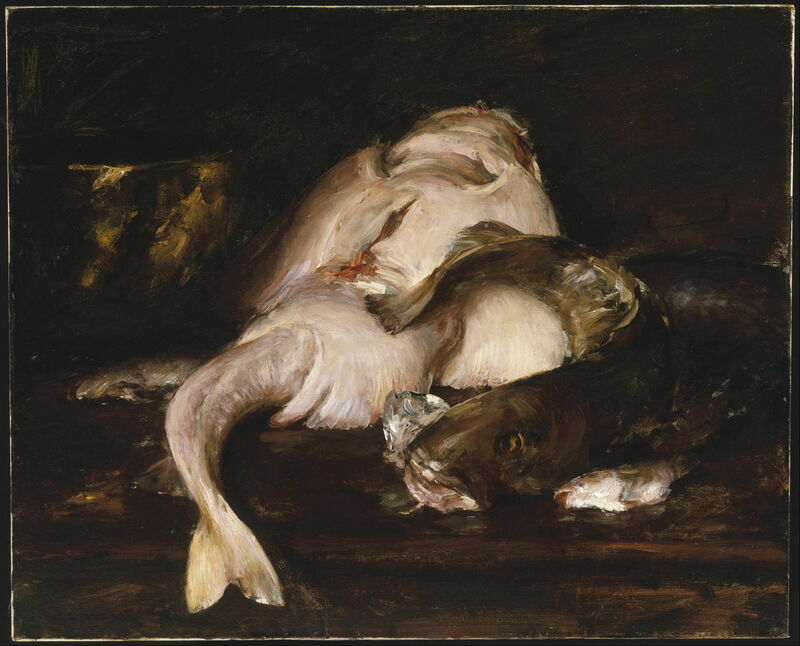 Paintings like Fish and Still Life (c 1904-1909) became Chase’s performance art. They may have been still lifes, but their greatest art was not in the resulting painting, but the performance of their making. He usually painted works like Still Life with Fish (c 1910) in just a couple of hours, as if a musician running through their scales and other warming up exercises prior to a concert performance. It’s claimed that he worked only with fresh fish – which looked best – and that he was able to return his models to the fishmonger, still fresh enough to go back out for sale. 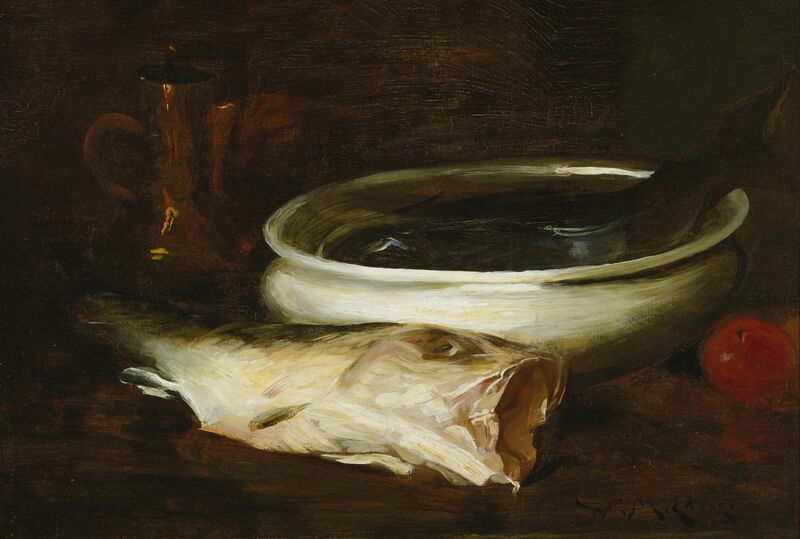 William Merritt Chase (1849–1916), Still Life, Fish (1912), oil on canvas, dimensions not known, Brooklyn Museum, New York, NY. Wikimedia Commons. The quick portraits and still lifes such as Still Life, Fish (1912) were also awarded as prizes to those of his students who excelled. They could then start the student’s personal art collection, or be used as a very sound investment. William Merritt Chase (1849–1916), Still Life (c 1913), oil on canvas, 89.9 x 106.7 cm, Saint Louis Art Museum, Saint Louis, MO. Wikimedia Commons. 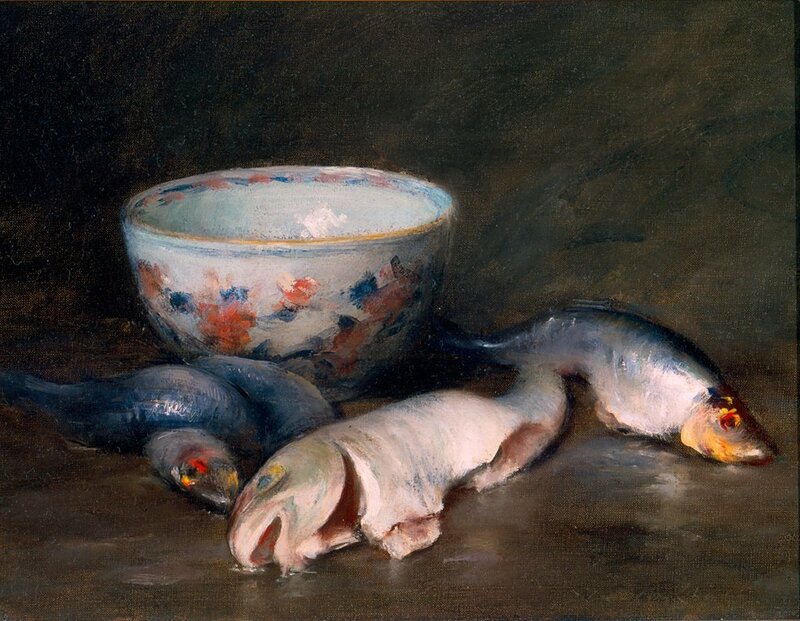 Even as he relinquished his teaching commitments towards the end of his career, Chase continued to paint his favourite fish, as in this Still Life (c 1913). It’s as if these fish had become an integral part of his working practice, and their silvery bodies a reflection of his artistic soul. Posted in General, Painting and tagged Chase, Fish, painting, still life, teaching. Bookmark the permalink.